Hundreds of parents commemorated the deaths of their children who had been killed when last month's earthquake caused their school buildings to collapse, and filed a collective complaint with a local court in Sichuan Province, against the quality of the school buildings, widely refer to in China as “tofu construction,” as a result of incompetence or corruption. Asia Week reported on May 30 that half a month after the tragedy parents have been building memorials and altars with their dead children's pictures one after another on top of the wreckage of some collapsed school buildings in the disaster areas. In Mianzhu City, at 2:38 p.m. on May 19—the first day of the three-day national mourning period, the parents whose children died at the Fuxin No. 2 Promary School (formerly Wufu Primary School) were the first to build memorials at the ruins of the school and sat quietly outside holding their dead children's pictures. In Dujiangyan City, on the third day of the national mourning, hundreds of parents of the Juyuan Middle School and Xinjian Primary School gathered outside of the schools demanding the authorities to thoroughly investigate why so many school buildings were destroyed and which government officials and building contractors are responsible. Later, parents of the Dongqi Middle School in Hanwang Township of Mianzhu and other collapsed schools did the same thing. One after another, the situation developed like a spark causing a prairie fire. With strong emotions from losing their children, the grieved parents expressed their distrust of the authorities. 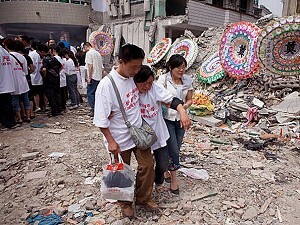 The emotion spread and affected many parents in northern and western Sichuan. Although many municipal authorities have promised to form investigation teams consisting of experts to discover the cause of the collapses, nothing could calm the parents who had lost their only beloved ones. Ms. Xiong Ying, representative for the parents of Wufu Primary School, says that whenever she closes her eyes, she sees the image of her daughter's face covered with brains. “When the earthquake happened, none of my surrounding buildings had collapsed. I thought my daughter would be fine. As a Kindergarten teacher, I took my children out of the building at the first time of the quake, so we didn't lose a single child during the earthquake. When I walked to my daughter's school at 3 p.m., I fell to the ground as soon as I saw the scene. How could this be? The entire school had collapsed,” she said. The reporter followed Ms. Xiong to the Wufu Primary School. After passing many buildings that remain standing, scattered debris and ruins of the former classrooms are encircled by undamaged buildings. Xiong recalled that as she crawled through the rubble to her daughter, who was still calling “Mom.” Unfortunately, her daughter died three hours later. At Dujiangyan's Juyuan Middle School, 400 out of 500 students were killed in their new school building. At Dujiangyan's Xinjian Primary School, 300 out of 400 students were killed. At Mianzhu's Wufu Primary School, 127 out of 309 students were killed. In Hanwang's Wudu Education Center School and Child Care Center, 300 out of 700 students were killed. Buildings in all six schools in Dujiangyan had completely collapsed, but nearby government buildings were all standing soundly. According to official statistics, the earthquake had caused 6,800 classrooms to collapse in northern and western Sichuan. The number provided by parents was even as high as 8,365. How many of these classrooms were made of cheap, shoddy materials? A foreign engineer volunteer named Abraham, questioned why these school buildings acted like they did not have reinforced concrete frames. He said that thickness of concrete should be used to fill in between bricks, but wondered why the site was full of sand. He suspected it might be poor binding, and wondered how the school buildings passed the government's building inspections. While being actively in contact with overseas media, parents like Xiong Ying and Li Xiaobing, holding pictures of their dead children, were marching to petition the township and municipal authorities to investigate the quality of the school buildings, while swearing to pursue justice. They expressed their outrage, saying that if their children had been killed in a natural disaster, the parents could accept their fate; but if the calamity was man-made, they parent would find the truth. In fact, what the Chinese regime is facing now, is no longer the 6,800 collapsed classrooms, but thousands of angry parents.